Dad (85) lives independently. He’s in pretty good shape, but fell in the shower, then fell again when he lost his balance standing up from the toilet. He won’t consider help or moving to an assisted living community. I’m worried he’ll really hurt himself. You’re right to worry—over 60% of people who die from falls are over 75 and 20%-30% suffer severe injuries that reduce mobility and independence. The key is “why” is dad falling? 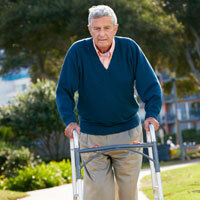 Start with a geriatric physician for a complete checkup including a review of his medications, vision, and balance. Evaluate dad’s bathroom: does the design match aging needs? Can he turn around without bumping sharp cabinet edges? Is the floor non-slip? For safety, dad needs a hand-held shower long enough to use while sitting in a non-slip shower chair, a raised toilet seat for ease of sitting and rising, and grab bars around the shower and toilet for leverage and to steady himself. Ask dad’s physician about programs for increased strength and better balance.